You will never want to leave this gorgeous, private, secure home. It is ideally located on a quiet street yet only a short walk away from the beach or the historic Plaza. Two of its bedrooms have king size beds and the third has two single beds. Each is air-conditioned and has its own bath. The large, modern kitchen is fully equipped. Enjoy your morning coffee on the huge rooftop patio while flocks of parrots fly by. After a day of sightseeing there is a beautiful tiled pool to enjoy in the fully enclosed landscaped garden. There are many artistic touches throughout the home including 20 foot beamed ceilings, custom cathedral skylights, stained glass and custom tile. The overall feeling is one of beauty yet comfort. Maid service is provided 2X per week. Telephone calls to the US and throughout Mexico are free as is the wireless internet. A crib and stroller are available. 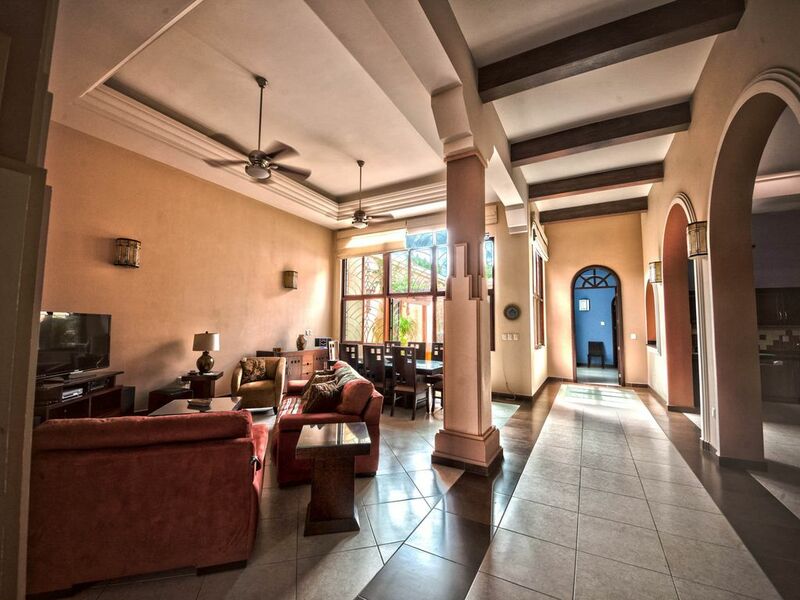 The home is managed by a local caretaker who can orient you to the property and Mazatlan’s attractions. We chose to purchase a home in Mazatlan due to the wonderful climate and outstanding food in the area. The historic district has beautiful colonial architecture and maintains the feel of a true Mexican town with the advantage of being steps away from the ocean. Our home is on a quiet street within walking distance of everything from the Plaza Machada with it's restaurants and cultural events to the malecon that rambles for miles along the ocean. Parking is available on the street directly in front of the house. Our family stayed in this home for 5 days. The proximity to the water and to good restaurants/entertainment is perfect. The home itself is even better in person than the pictures. Absolutely beautiful. the patio area with pool is perfect for your morning coffee. Most importantly, the home felt VERY safe at all times. We are already planning our next trip and will be staying here again! Stunning! Peaceful! Beautiful! Surpassed our expectations in every way. This 10 day vacation to MZT was my favorite vacation of all time, largely due to this amazing home. It looks beautiful in the pictures, but pictures don't do this place justice. From the moment we walked in, we were taken aback by the high ceilings and how large the house is. Upon arrival we were met by the property manager who is also the architect of the house. Pepe is very friendly and showed us around the home. From there we took a very short walk over to the malecon and enjoyed all the sights, sounds, and flavors the playa has to offer. Breathtaking architecture, friendly people, amazing food, and adventure were all right around the corner from this amazing home. The rooftop terrace was the perfect place to unwind after a long day, and our kids loved the pool. The kitchen and large dining table were perfect for our large family. The bathrooms were well stocked with plenty of towels and we really enjoyed the large over-sized showers. The internet clocked in at about 20mbps which is plenty fast enough for our kids to watch youtube on multiple devices and for my oldest to stream video games on his PS4. There is a seperate office where I could have worked from, but who wants to work on vacation right? If I could rate this home a 10 I would. We are very thankful to have stayed in this home and will most certainly be booking again With Eva and Michael next year when we return to MZT. Thanks again for another relaxing visit. Wonderful space and location. Enjoyed our walks everywhere, to the beach, local restaurants and exploring the streets (now redone) of Centro Historico. Fabulous stay at Casa Marez! Casa Marez is as beautiful as it appears in all the VRBO pictures - it completely renovated exquisitely furnished. The three large bedrooms and en suite bathrooms are perfect for three couples. The kitchen is fully stocked with pots, pans, and everything needed for making guacamole and huevos rancheros. The location could not be better! Located on a quiet street in the “Centro” just two blocks away from the Malcon, the lovely ocean front 5 mile ‘boardwalk’ from the Centro to the big hotels in the “Golden Zone”. Everything is within walking distance...and what isn’t is easily accesses by the ever present golf cart “pulmonias” or the “red trucks”. We enjoyed the sunset views from the top of the Posada Freeman hotel, deep sea fishing with Aries Charters out of the El CID marina, and .... the incredible beach on Stone Island (Isla de la Piedra) which goes on for MILES. Plan to spend the day over there relaxing at Lety’s and enjoying a wonderful lunch. Casa Marez is just blocks from the old square which has many, many fine restaurants. Dinner at Casa 46 is a must as is Topolos. An don’t miss the opportunity to shop at the Mercado for fresh ingredients for guacamole and huevos rancheros. Fabulous location! Very pleasant stay away from the hustle and bustle. This beautifully designed home is well located one and a half blocks from the beach and 1 to 6 blocks from incredible restaurants, music, shopping, and conveniences. Please note that your reservation is for a specific number of guests. If you plan on having additional guests it is necessary to get prior approval from the homeowner.